I have ever been to Indonesia by following a Fulbright Program. Although I think I am success person, my only mother asks me how about the food. I tell him I love noodles chicken. For a native English speaker, not to mention one that is tasked with teaching English, the above sentences are gross perversions of our native tongue. I have had the urge to tie sentences like these to a chair and torture them with a pen, until they have confessed that they were wrong…oh so wrong. But I have begun to see fewer issues with sentences like these. Have I become accustomed to the grating dissonance of “where will you go?” for instance? Absolutely not. This phrase will haunt my dreams into my early 40’s. However, it is both grammatically sound, and it communicates a perfectly intelligible question. I do not believe it is difficult to convince other ESL teachers to hold our tongues when it comes to correcting grammar when students of English are still rehearsing a basic expression of their ideas. In sentences where so much is going right, correcting an apostrophe can open Pandora’s box (which was actually a large jar). When we make corrections to words and sentences that don’t betray communication, these corrections can be so discouraging that the act of doing so may undermine our very efforts to teach (though attitudes towards correction surely vary amongst individuals, neighborhoods, and nations). But what if I were to tell you that there was in fact nothing wrong with the initial sentences? I do not mean to say that we should just tolerate their utterance with a reluctant smile; I mean that there are no grounds for their alteration. Knee-jerk objections should range from the fact that noun/pronoun (dis)agreement and an improper placement of an adjective and adverb produce confusion. However, when I met a group of Australians with delight to hear the soothing tones of English, I reckon I was not too keen on it because this one bloke was accusing us of codswallop when we were, in retrospect, fair dinkum. Their English produced confusion for me as well. Take what we should hesitantly call, “Ebonics” or “Southern English” which might could confuse an “English” speaker too, and we can see that amongst English-speaking countries, and even within one, we still misunderstand each other due to differences in vocabulary, syntax, and pronunciation. Considering the variance of these essential components of language, does “English” even exist? The proponent of English’s definite existence, which profoundly objects to standing idly by while innocent English sentences are massacred, is called prescriptivism. Prescriptivism proclaims the necessity of a language’s standardization and dies a little inside every time someone says “revert back” or enters a “10 items or less” line with fewer than 10 items. Surely we cannot ignore the need for a standard. Despite those who continue to wage the revolutionary war against the Oxford comma, our agreement on “Standard English” theoretically allows every English speaker to understand another. If in that communication there are appeals for clarification concerning meaning the standardization of our language also allows us this recourse. But what about the way we actually speak? What about playing with words? What about the colorful neologisms and the expressions that are the result of saying, “prescriptivism be some bull****” and that give flavor to poetry and prose alike? Playing with a standard can only exist because of the existence of a standard. However, I think we can agree that hardline prescriptivism that wags fingers at “y’alls,” “yo’s,” and “aint’s,” is yucky. My American friend’s quirky word choice mutates into something that is wrong for my Indonesian friend to say. This may be because I can assume my American friend knows the word for “jeans” and “pants” and is simply choosing to play off of them. The line between grammatical error and acceptable deviation from contemporary English here is an issue of entitlement based on having information. We may have a tendency to correct “awkward sentences” (a debatable grammatical error) because they come from a lack of information, which we have in abundance. But what if our American friend never knew the word “pants”. 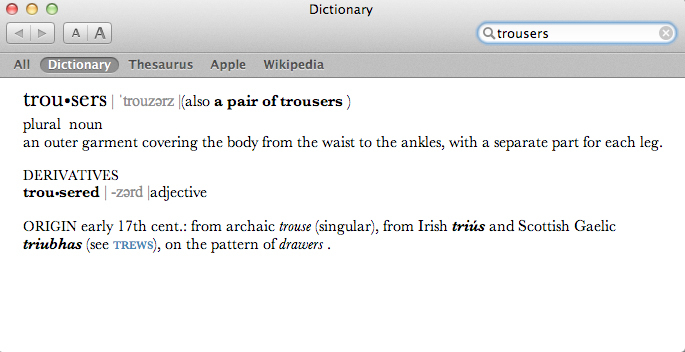 And let’s say that my Indonesian friend is well aware of the word “pants” having worked in an American pants factory, but revels in the reverberation of the word “trousers.” What do we make of that? Mrs. Day, my High School English teacher, used to say, “You can break the rules, but first you have to know them.” Yet, if we still feel that the American English speaker’s use of the word “trousers” is more acceptable than the Indonesian’s maybe there is a deeper issue here. Maybe it is pride. Maybe we earn our language. Maybe no amount of information someone else gathers learning English supplants that that we were told we were loved in English by our parents before they tucked us in, that we read the backs of cereal boxes in English while we tried to ignore our siblings, that we passed notes in English to our best friends during English – that we lived in a place where English reported our deepest moments and formed the basis of our deepest relationships. Is it possible that non-native speakers have not earned the “right” to play with our language? My college philosophy professor once told our class that we are always becoming and never are. “For example,” he said, “maybe you play the piano and you are really good – but you are not a piano player because tomorrow your hands could get chopped off.” I take what may have been a thinly veiled threat to heart in that I am not, no matter how much I would like to be, determinately anything. I am not an English speaker. I only perform and play with English because tomorrow my tongue could get chopped off. My set of experiences, though wedded to an English-speaking country, do not make my English performance or play normatively better, only more rehearsed. So teach Bahasa Inggris so that we can teach the rules; but if you see fit, allow for the possibility of Bahasa English so that they can be broken too. About the author: Max Bevilacqua is a Fulbright English Teaching Assistant in Magelang, Central Java. He graduated from Wesleyan University with a degree in Religious Studies. “Mas” (the way one addresses a young male) can be paired with “bro” to form an Indonesian/English phrase to address, most often, another young male in a way that is “cool”.